This week, I wrote a Doodle Insights on angles and I worked on Flying Pop-Pop! Sadly, there was no Pico-8 doodle this week. The week started not-so-well with me being late on the last weekly-recap and then on the Doodle Insights. But for the Doodle Insights, it really is because it was a difficult piece to write. It was about angles and how turn-based angles (which go 0..1 instead of 0..2pi) are better than angles in degrees and radians. It was pretty different from the usual Doodle Insights, very interesting to write (and hopefully to read) but also really hard! Writing about maths for a whole article felt really weird and making it not-boring for the average reader, who may not be a maths expert, was a challenge. But I think I did a good job of it if I do say so myself! A few people have been reacting to the article which was very interesting too! I compiled the points that were made and the extra informations that were given in an update added at the end of the original article. It really made me want to make other articles that can be discussed in the future! You can read the Doodle Insights #17 about turn-based angles over there! And I finally went back to Flying Pop-Pop! I also changed the artstyle a bit and added an originally unplanned feature that lets you gather enemies with the right-click! But mostly I worked on the visual effects! 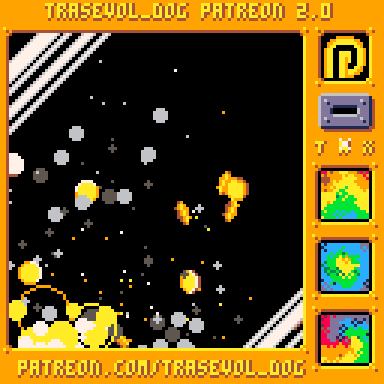 There was actually a lot of trial-and-error, mostly on the explosions and on other effects that were temporarily removed from the project until I can make them good. I’m really happy with the results so far though. The idea is that the gameplay happens in the foreground, in what is drawn in white, and the background provides additional information through satisfying effects. It’s an interesting new direction but it does mean I have to rethink some of the original design and get deeper into it, especially with the new vortex ability. On the gameplay side, the game went from being a simple shooter to a shooter about blowing the most things up in one shot. I like it! This week, I should figure out all the gameplay-related effects and implement them and then implement the different enemies and the other missing gameplay elements and hopefully put everything together. If I can do all that, only the music and the sound effects will be left to do before the release. I’m also planning to make some extra content external to the game (probably wallpapers?) for the people who will support it on Itch.io! I released the first Patreon-exclusive wallpaper! It’s available in 52 different resolutions including desktop and mobile resolutions, to all my 1$+ patreon patrons! I didn’t get the time to do the Patreon video but I did change the Patreon goals! I made them more relevant to my needs and also I added a monthly goal! If and when we reach it, there’ll be a Patreon poll to decide of something I will make in 48 hours! It could be a game, a tutorial gif, a special article… The patrons will get to choose! (if we reach it) The June goal is at 300$ and it’s only 17$ away as I write this! If you want to help us reach it, it’s over there, thank you! I did get time to play some more with Processing but didn’t make anything worth sharing. For each idea that I had, I couldn’t find a way to make it that I liked or it didn’t look as good as I thought it would. It’s ok, I’m learning! Next week, I’m mostly working on Flying Pop-Pop! I want it to be an extra-productive week, so there may not be any Pico-8 or Processing doodles again. (unless I get a sudden burst of inspiration?) There will be a Doodle Insights #18 though! And the Patreon video!